SURVEY ASKS: WHAT SHOULD THE ERNST PARK ADDITION BE? 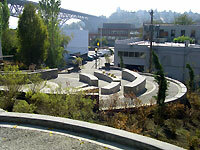 Ernst Park in downtown Fremont, between the library and the building that houses Agrodulce–where Still Life in Fremont used to be–is only half developed. That half provides ADA access to the library’s lower floor and a pleasant place to sit on sunny days. Now Seattle Parks and Recreation (SPR) plans development of the other half of that open space on N. 35th with funding from the Metropolitan Park District. SPR says, “Ernst Park is being expanded! The following survey gives you and other community members an opportunity to share your ideas about this park project. We are interested in finding out more about how the park being used, and things you value or would like to see at Ernst Park. Although we can’t include all input in our park design, our goal is to work with the public to create a community designed park project.” Take the survey here. I am so excited that this space will be developed! I live in Fremont with my two children and we come to this space about once a week to play. It would be amazing if this new area could incorporate some kid-friendly or kid-specific play area–like swings or a structure of some kind. There are so many children that use this to play because there are so few open spaces in lower Fremont. Thanks for considering!